Isn’t the word steak tips just the worst? It makes me feel weird. Just the tip. Ew. It’s just weird. And even weirder since my father is probably reading this. LOOK AWAY DAD!! So after getting through the first awkward feeling after I opened up my ButcherBox order to find just the tips, I did a little digging on their site to see what was the best way to cook them. I honestly thought steak tips were just like stew meat, so I was ready to throw them in a slow cooker. 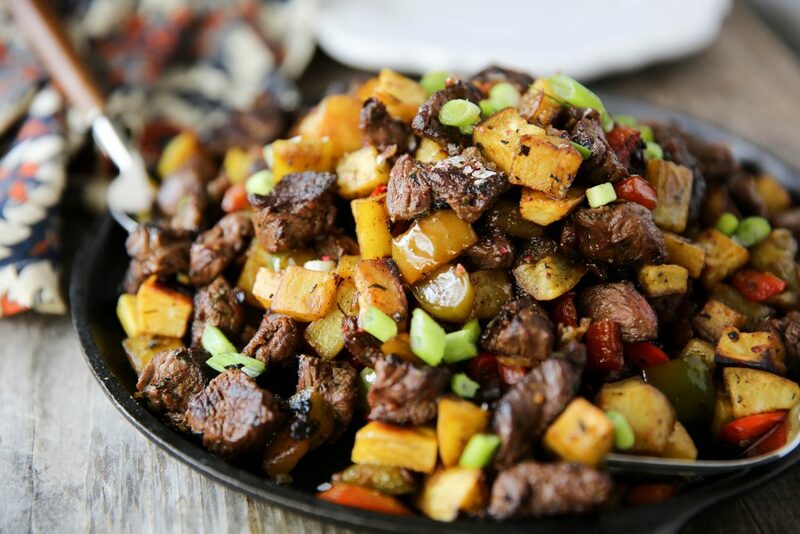 But turns out, their steak tips use beef trimmed from the various tender grilling steaks including cuts from tri-tip, culotte and sirloin so you can cook them up in multiple ways. And since marinating makes everything better, I marinated the sh*t out of these little tips. And this meal rocked my world. And my husband couldn’t stop eating it. That’s a big deal since he’s not a food freak like me. Have you tried out ButcherBox yet? PaleOMG readers get $10 off their first order + free bacon! They’re the best! 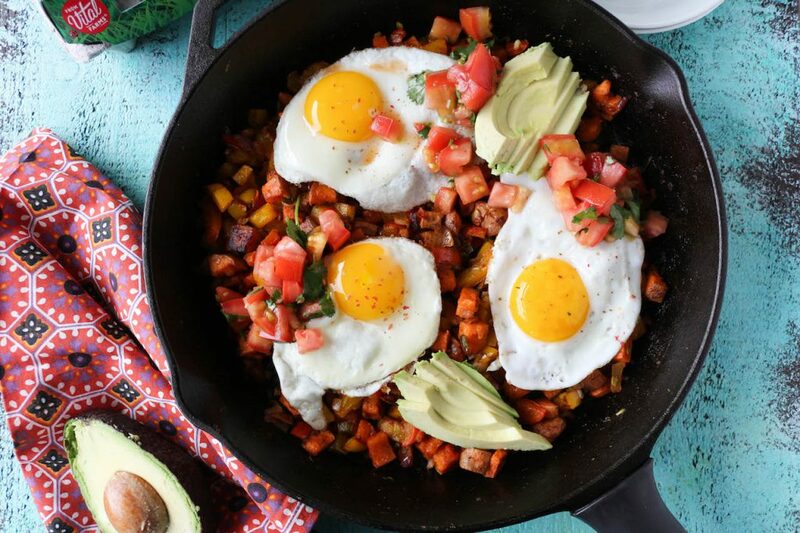 So I’ve been eating egg free for quite some time now, but if you’re an egg lover, this meal would be even better with a runny egg on top. Even though I’m egg free (just because it makes my skin break out), I still dream of making out with eggs daily. Ew, that sounded weird. Weirder than steak tips. But I’m holding true to what I said. Eggs are life. Literally. Yesterday was a major down in the dumps day. Not only did I PMS like a psycho path over the weekend, but then I had to deal with some personal stuff that didn’t help the situation. THEN I got a head cold. Plus a cough from a super hard workout. So I spent the night sleeping on the couch, trying not to wake my husband with my exploding head. Luckily, if one of us ever moves to the couch, our little doggy man Jackson followers and snuggles with us. We snuggled face to face last night, which was cool with me since he got a bath yesterday. I love that dog so damn much. Even when he decides to be scared of a nordstrom bag on the floor and starts to bark at it at 3 in the morning. Not his best look. Even though the past few days were a bit emotionally exhausting and I’m working out very few hours of sleep right now and in need of some therapy, I’m ready for today to be a great day. So I’m starting here and making this great day manifest through typing up some words and putting a smile on my face. Fake it til you make it, right?! RIGHT! Time to cook for you guys and create some new content that you hopefully love! Happy Tuesday, you lovely person who took the time to read this!! 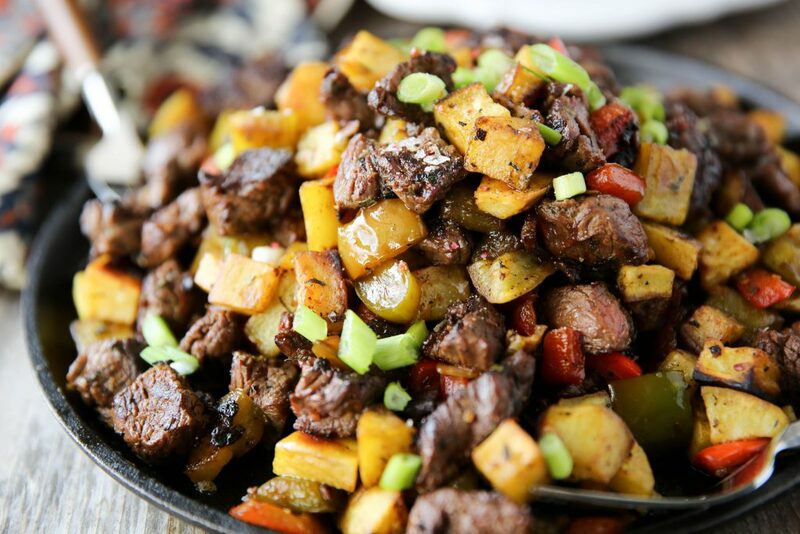 Place steak tips in a shallow bowl then whisk together the rest of the ingredients for the marinade. Pour marinade over steak tips, cover and place in the fridge to marinate for 8 or more hours. Preheat oven to 400 degrees F. Line a baking sheet with parchment paper, toss sweet potatoes in melted ghee and sprinkle with salt and place evenly throughout the baking sheet. Bake for 25-30 minutes, tossing them half way through to help brown on all sides. While the sweet potatoes bake, place a large cast iron skillet over medium heat. Add 1-2 tablespoons of ghee to the pan and once it is very hot, use tongs to place steak tips in the pan, making sure not to crowd the pan. This will let the beef brown and cook evenly, without steaming it. Cook steak on both sides for 2-3 minutes, depending on the size and thickness of the steak tips. Once cooked to your liking, place on a plate and set aside. Repeat until all beef is cooked through. 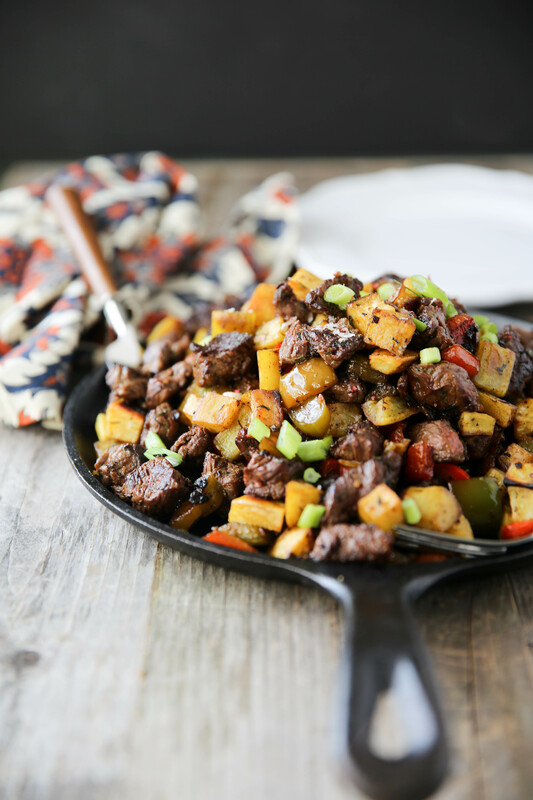 Once beef is done, add another 1-2 tablespoon of ghee to the pan (if needed) then add the bell peppers and onions. Toss and cook for about 10 minutes, until the onions are translucent and peppers are slightly browned. Then add garlic and cook for 2 more minutes. 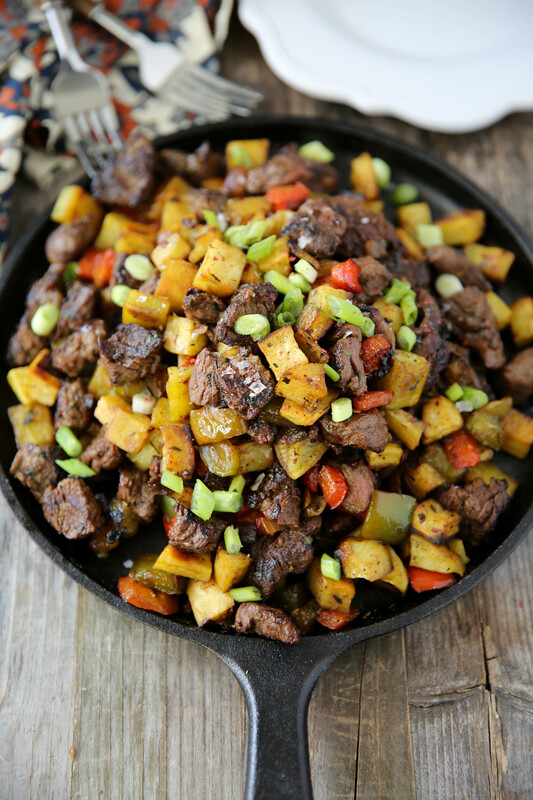 Lastly, add the sweet potatoes and the beef to the cast iron skillet with the veggies and cook for another 2 minutes to warm everything through and combined. Garnish with green onions and serve it up! This sounds and looks delish!! Can’t wait to try it. Hope you can get some sleep and feel better Julie! Looks so damn good! Hope you get to feeling better. That little Jackson would make most things better. You’ve totally convinced me that, if you try hard enough, anything can be a hash…AND I LOVE IT! I’ve been making random hashes for dinner every now and then and it’s just a game changer. Anything that’s quick, easy, AND healthy is a bonus in my book. hashes are KING!! hope you love this one! 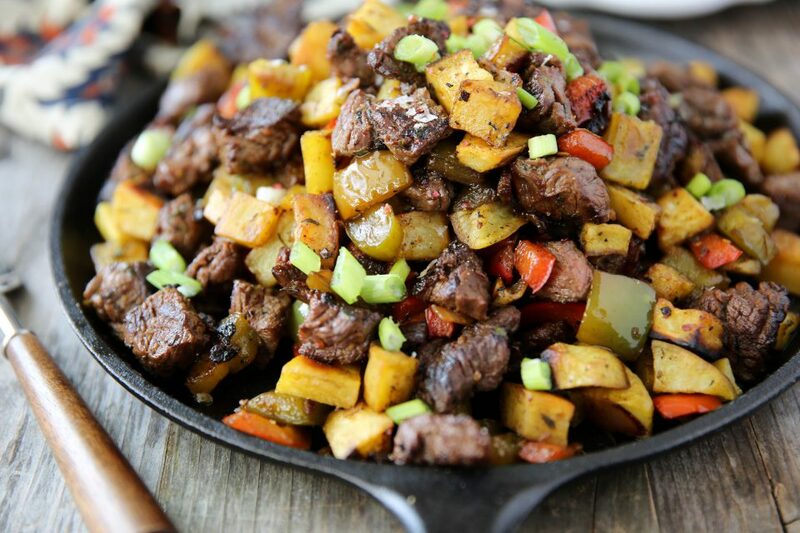 OMG this looks amazing, yeah I never thought to use steak tips, I’ll have to try this! interesting!! that must be true because it all happened at once!! LAME! My boyfriend doesn’t convey a ton of emotion over text message but when I just sent him this recipe he replied with “OMG”… safe to say i’ll be marinating my tips tonight! “Marinating my Tips” – I don’t know why, but that made me burst out LOL. (Never a bad thing) But, YASSS. Me, too. This hash looks BOMB. Hey Juli — this looks amazing! Any suggestion on what to use if I can’t find steak tips. I haven’t seen them at my butcher. ask your butcher what they recommend for steak tips but like i said in the post, they use cuts of tri-tip, culotte and sirloin so you could always cut up your own steaks! Looks great. Have you tried eating fertile pasture raised eggs, and if so, did you get the same reaction as eating normal pasture raised eggs? I don’t have any bad reactions to eggs but a family member did and someone suggested he try fertile eggs. Can’t wait to try this!! Going to marinate tonight!! YUM! This looks awesome! I’m about to meet a friend for lunch and there had better be steak tips on the menu after this tease! I am definitely making this myself later though. Laughing out load over here (literally) from that “just the tip” comment!! 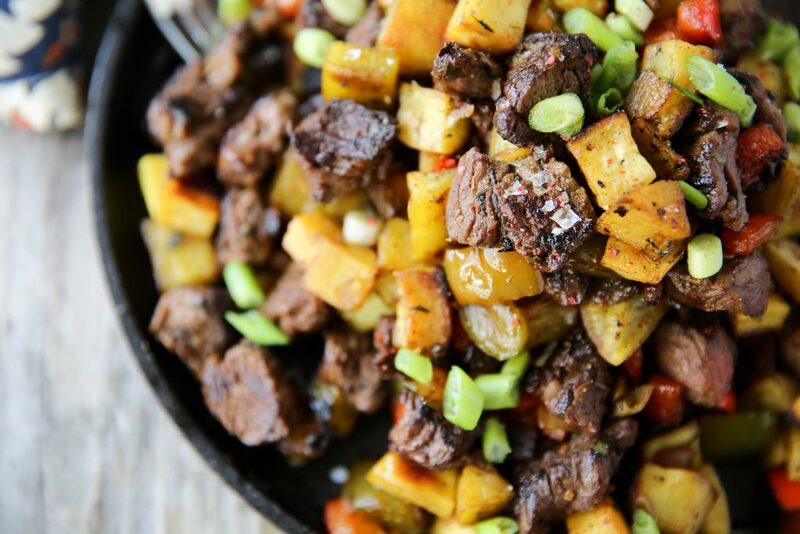 This hash looks delish. Love that you used steak! The steak is marinating in the fridge overnight. My husband and I will be making this dish together for dinner tomorrow. We have already made and eaten it for dinner (east coast). The recipe made so much food I think that we will be having leftovers later in the week. Definitely one we will make again! This looks so good! Thanks for sharing! I also have an egg allergy, and I was wondering if you have any tips for egg-free breakfasts when eating out? I feel like every time I go to a breakfast/brunch spot, the only healthy menu options include eggs. Are you able to easily find egg-free options when you eat out, or do you do a special order based on ingredients you see available on the menu? For example, it seems like the only way to get veggies is whenever they’re in an omelette or scramble. Just curious to know what you do when you eat out! Thanks so much for all of the content that you share! i find it pretty easy! there is usually some sort of steak and eggs that usually comes with potatoes so i just ask for no eggs and see if there can add in any sort of veggies. you just have to ask questions! 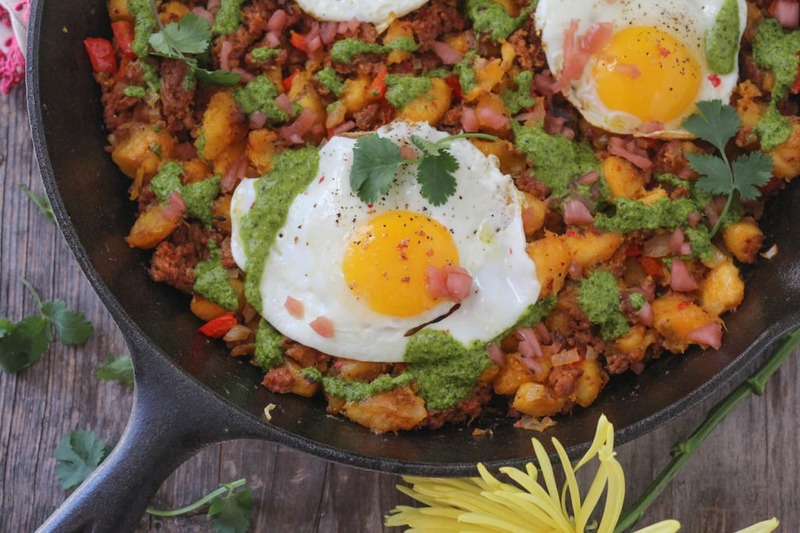 or if something like a corned beef hash is topped with eggs, just ask for no eggs! Ugh yes tips, such a weird word for a cut of meat! Pretty sure I would’ve done the same thing and stuck them in the slow cooker if I hadn’t been following this recipe, ha! Hope you start feeling better soon! PMS is a b******tch. The worst!! Dear baby Jesus this is delicious!! I cannot wait to put an egg on left overs in the morning! I maybe only want to eat this for the rest of my life. Juli you’re the best! This looks so good! Already marinating the steak! I wasn’t able to find white sweet potatoes, though. Would you sub regular sweet potato, or white potato? I made it for supper Sunday night. It turned out delicious. I can’t leave well enough alone, so I also added some chopped celery and mushrooms. I also chopped a poblano pepper for a little extra flavor. Thanks for the recipe. It was great! I have a picture, but can’t seem to post it on here. Made this over the weekend and it was DELICIOUS! Definitely a new favorite “go-to”! Thank you! awesome!! thanks for trying it out!! so glad you loved it! I had the same thought with my butcher box! I am so glad you posted this so I didn’t ruin the beautiful, tender meat. (That sounds funny). Thanks for a great recipe that my husband will enjoy also. This looks awesome! If I can’t have dairy due to an autoimmunity- what would you suggest in replacement of the ghee? This is seriously delicious! I love it so much! I’ve already made it twice. I’m also thinking that marinade would be amazing on steak for kabobs! Thank you so much! so glad you liked it, amy! I wonder how this would taste if you used plantains in place of the sweet potatoes? Any thoughts on that? i’m sure it would be amazing! I cannot stop making this meal!!! I’ve made it 3 times in the last couple of weeks. Thank you for saving me from grilled chicken and turkey chili. OMG, this was the best! My wife put it in the top 5 of meals I make and I make A LOT of PaleOMG meals from your book. Thanks! Wow! Just made this and it was amazing! This was bomb! ??? ?Every single one of your recipes I’ve ever made has been delish. Thanks, Juli!???? This was SO freaking good. I’d say it’s in my Top 10 recipes of all time. Thank you, Juli! Also glad to see that Jackson is home and doing better! yayyyyy!! so glad you liked it tory! and thanks for the jackson love! Can I use coconut milk as a substitute? as a substitute for what? Finally made this recipe! Delicious and lotsssss of leftovers. thanks!